Are you a first responder who is in dire need of a new home? Or do you know a firefighter who is a hero in the community but is barely hanging on when it comes to their house? ABC’s Extreme Makeover: Home Edition is looking to feature more firefighters in the upcoming season and is now accepting nominations. Interested families or those who wish to nominate another family should email a short description of their family story to David@emhe.tv. The names and ages of each member of the household. A description of the major challenges within the home. Explanation of why this family is deserving, or a positive role model in their community. Don’t forget to include a contact phone number. Submit your nominations ASAP to be considered for the upcoming season. AMERICAN CANYON -- When time is of the essence, less is more, and American Canyon will get more for less starting in July when fire district dispatching switches from the California Department of Forestry and Fire Protection to Napa Central, American Canyon and Napa officials said. The new arrangement is expected to shave at least seconds off response times to fires and medical calls. Calling the "strategic move" an example of "good government," City Manager Rich Ramirez said it's a "win-win for both cities." The longtime contract between Cal Fire and the fire district ends with the fiscal year on June 30, and the contract with Napa starts immediately thereafter, American Canyon Fire District Chief Glen Weeks said. Though the cost of continued Cal Fire services is unknown, it was expected to be higher than this year's $44,000, Weeks said. The new contract is $65,000 annually for two years. Quick to note that no one was unhappy with Cal Fire's dispatch services, Weeks said the decision to change resulted from several factors. "Cal Fire just started charging us for dispatch this year -- it's been free 'till now -- so we never considered changing," he said. "When the state had to start charging us, we looked at alternatives and found the advantages with Napa Central seemed the most prudent choice." Though Napa Central Dispatch has long handled American Canyon Police Department and other local agencies' emergency calls, American Canyon's fire calls were routed to Cal Fire for dispatch, Weeks said. "When a 911 fire call comes in, the center transfers it to Cal Fire in St. Helena," center manager Lt. Debbie Peecook said. "On medical calls, we assess the situation, walk the caller through what to do, while notifying Cal Fire to dispatch and we get hold of local ambulance service. This will cut out a step and could save lives by shaving seconds up to a couple of minutes off the response time, and seconds count, especially in medical situations." 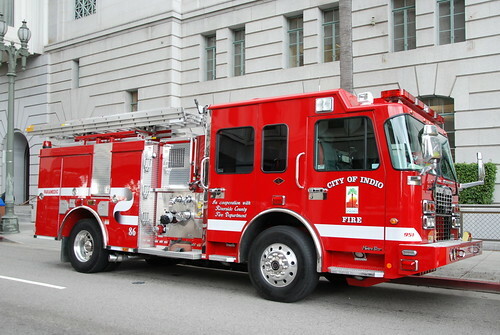 The move will allow the activation of enhanced technology, including mobile data computers that the district has but which didn't work with Cal Fire's equipment, Weeks said. "This will reduce voice radio traffic, and display information on a screen in the engine," Weeks said. "It's the latest technology. Police Departments use it. All the information on the call appears on a touch-screen computer that allows you to communicate with dispatch." This reduces call processing time and the Computer Aided Dispatch system tracks information automatically, enhancing accuracy and saving firefighter report-writing time and effort, he said. At Napa Central Dispatch, the new level of cooperation is being well received, Peecook said. "Everybody here in the city of Napa is very excited about the change and cooperation," she said. "This will save time and increase the level of services for American Canyon." From now on, the center will send a team to major emergencies in American Canyon to reduce confusion and help with coordination and accountability, she said. A joint powers agreement between American Canyon Fire and Napa City Fire entered into last year involves sharing resources including battalion chief response to major incidents, Weeks said. In Hawaii fire activity is already occurring. There has been some relief from the drought, but it is not expected to last. Some areas have already exceeded the 90th percentile for ERC. The west sides of the islands seem to be the most susceptible to wind which exacerbates fire conditions. KBDI values are in excess of 500 in several locations across the islands. For Hawaii much of the vegetation is drought-stressed. The fuelbed contains much more dead fuel than typical and measured live fuel moisture is below average. 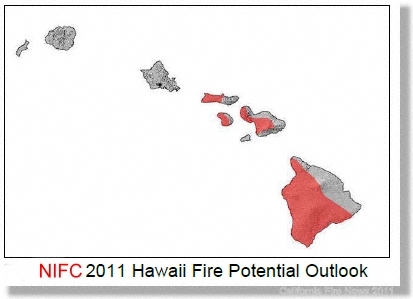 The islands of Kaua'i and O'ahu will experience normal to above normal fire potential. The remainder of the state will be above normal. This preliminary outlook is a product of the National Seasonal Assessment Workshop held virtually during the week of April 18th, 2011. The inter-agency workshop brought together subject matter experts from climatology, fire weather meteorology, fuels, fire behavior, and fire danger. The outlook is based on past developments, current conditions, trends, and predictions for the months May through August. • Provide a prognosis of 2011 wild-land fire potential in California, based on fuel conditions and available climate forecasts. • Highlight concerns and key implications for management. • Provide supporting documentation regarding weather and fuels information. • Provide the framework for comprehensive final North Ops and South Ops outlooks to be completed in June. This executive summary should aid California wildland fire managers in 2011 fire season preparedness, and add preliminary insight. More detailed fire season outlooks, for both North and South Ops, will be available in June. Those documents will give increased detail regarding all aspects of the coming fire season, and will have higher confidence levels. In addition to this outlook, the GACC Predictive Service Units at Riverside and Redding will continue to issue detailed monthly assessments of fire weather and fire danger. 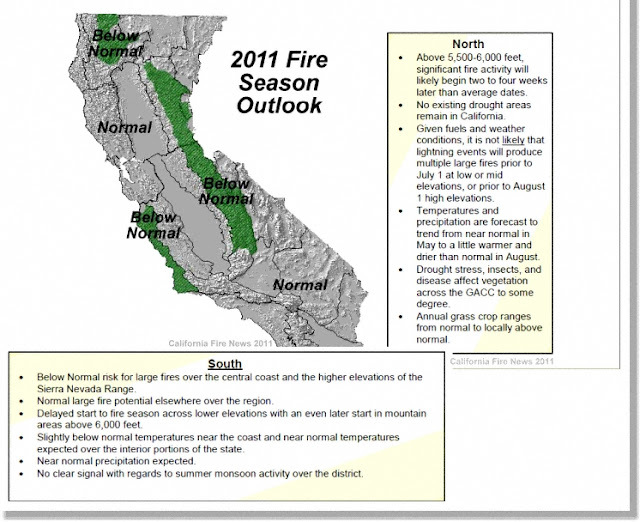 Fire season for the majority of Northern California is expected to begin in typical May to June time frames. However, elevations at or above 5,500-6,000 feet had an April 1st snowpack ranging from 125-170% of normal (see Figure 2). For that higher terrain, significant activity could be delayed until the start of August. • The height and continuity of annual grass crops ranges from generally normal, to locally above normal. • For high terrain, significant fire activity will likely begin two to four weeks later than average dates. • Given expected fuels conditions, it is not likely that a lightning event will produce multiple large fires prior to July 1 at low-mid elevations, or prior to August 1 at high elevations. Temperatures and precipitation are forecast to trend from near normal in May to a little warmer and drier than normal in August. • Above 5,500-6,000 feet, significant fire activity will likely begin two to four weeks later than average dates. • Given fuels and weather conditions, it is not likely that lightning events will produce multiple large fires prior to July 1 at low or mid elevations, or prior to August 1 high elevations. • Temperatures and precipitation are forecast to trend from near normal in May to a little warmer and drier than normal in August. • Drought stress, insects, and disease affect vegetation across the GACC to some degree. • Annual grass crop ranges from normal to locally above normal. • Below Normal risk for large fires over the central coast and the higher elevations of the Sierra Nevada Range. • Normal large fire potential elsewhere over the region. • Delayed start to fire season across lower elevations with an even later start in mountain areas above 6,000 feet. • Slightly below normal temperatures near the coast and near normal temperatures expected over the interior portions of the state. • Near normal precipitation expected. • No clear signal with regards to summer monsoon activity over the district. There will be a below normal large fire potential over many high elevation sections of the district where heavier fuels are present. Large timber (as defined by 1,000 hour fuels having trunk diameter of 7 inches or greater) currently possess a large amount of moisture from the heavy precipitation of the past winter. It appears unlikely that these heavy fuels will dry to the point of receptivity during the outlook period. However, large fire potential will increase in lighter fuel types by late summer when the hottest weather arrives and fuel moisture reaches a seasonal minimum. Many long-term models indicate the current La Niña condition over the Eastern Pacific will continue to decrease this spring, reaching a near neutral sea-surface anomaly by this summer. Other models indicate a La Niña may re-emerge later this year. Either way, the affect of sea surface temperatures appears to be a non-factor in determining the weather patterns late this summer and into fall. Therefore, outside the aforementioned areas in the higher elevation regions of the Sierras and portions of the central coast, expect a near average fire season this year. In the South, precipitation in South Ops during the past winter was above average in most areas. The early winter and early spring rains have brought an above normal crop of seasonal grasses to the foothills and desert areas. The December rains resulted in an early emergence of herbaceous annual and perennial fuels. NDVI departure from average greenness data showed 135-150% average greenness for Central and Southern California. Live fuel moisture values in the lower elevations are running above average across the inland areas, but across the coastal regions, especially north of Point Conception, conditions are wetter than average. 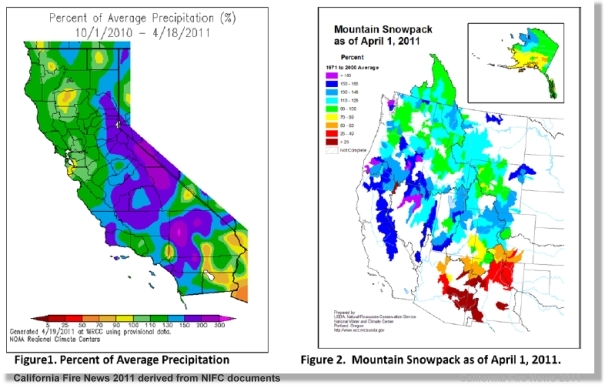 The latest snow pack surveys measured 165% of April 1 snow water equivalent in the Sierras. The expected weather conditions along with the antecedent fuel conditions suggest a normal fire season with the exception the Central Coast and the central Sierras which are expected to have a below average large fire potential. A big factor will be the weather in the next six-ten weeks. This could change overall live fuel moistures and grass curing rates across the South Ops area and may result in a later or more normal start to the fire season. In the North, Northern California is emerging from several years of drought; vegetation remains drought-stressed. Winter conditions have resulted in windthrow, broken tops, and freeze-damaged vegetation adding to the fuel load, contributing to fire behavior potential and reducing fireline production rates. Green-up has already occurred at elevations to about 2,000 feet. Curing is beginning to occur in grasses at the lower elevations. There is abundant grass and brush at the lower elevations; at higher elevations (to about 6,000 feet) where snow melt has occurred herbaceous vegetation is also abundant. Spread of insects and diseases and non-native species, changing land use, fragmentation, and urbanization all affect fuels and contribute to fire potential in Northern California. Any drought-stressed or otherwise unhealthy vegetation will succumb to fire easier than healthy vegetation. Expect "normal" curing of herbaceous fuels. An abundant grass crop at the lower elevations will provide the opportunity for large fires starting about mid-May. There is good fuel continuity. Brush has substantial leader growth and is leafing out. Greenup and flowering are currently occurring, predominantly at the lower elevations. By August 1, energy release component (ERC) and 1000-hour fuel moisture should be approaching the 80th percentile at elevations below 6,000 feet. As snow melts, we are seeing areas that are inaccessible due to blow-outs and other damage to the transportation system - this will result in additional response times for ground-based resources. California does not intend to issue a Fuels and Fire Behavior Advisory this year. North: Review of October 2010 to April 2011: A La Nina pattern that developed in the summer of 2010 reached peak strength in January of 2011. It has been on a gradual decline since, though its effects on California weather have been more typical since mid February. October, December, and March were the wettest months compared to long-term averages, while January was the driest, due to mid-winter high pressure dominating for over a month. A large majority of Northern California currently has season-to-date precipitation ranging from 100-150% of normal (Figure 1). Due to this abundant rain and/or mountain snowfall, drought has ended in California. Mean temperatures were mostly within + 2 degrees F of normal for most of the Area (Figure 3). May - Northern California is expected to see temperatures within 2 degrees of normal and near-normal precipitation. Snowpack will continue to recede, but will still be well above average over high terrain. June - Temperature anomalies forecast to range from -1 to +2 degrees F, with precipitation most likely to favor the lower side of normal. July - Temperature anomalies forecast to range from 0 to +3 degrees F, with precipitation at or below normal (which climatologically means very little). August - Temperature anomalies forecast to range from +1 to +4 degrees F, with precipitation continuing near to below normal. Lightning events are the biggest “wild card” in Northern California fire seasons. At this time, it is expected to be a near-average type of lightning year. This approximates out to 2-4 limited events on a sub-GACC to GACC-wide scale. There is a 20-30% chance of a large and/or critical dry lightning event of GACC-wide impact before year's end. It would be most likely to occur in late July or August, as fuels would probably not support reaching a siege-type event any earlier. 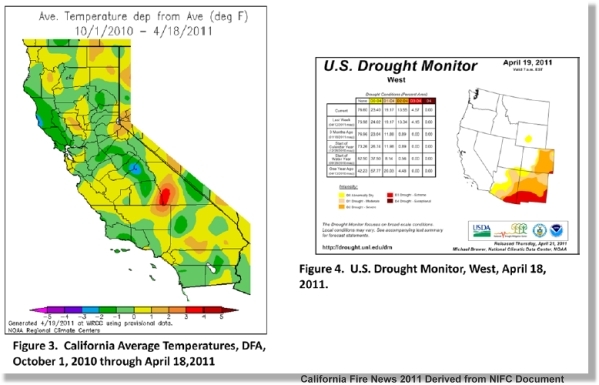 Drought caveat - While large-scale drought is not a factor in California as of mid-spring 2011, it could again become so by late fire season IF the weather becomes persistently hotter and drier than the modest warm anomalies contained in this forecast. Tom Rolinski – Fire Weather Meteorologist, USDA Forest Service, Predictive Services in Riverside, California. Rob Krohn – Fire Weather Meteorologist, USDA Forest Service, Predictive Services in Riverside, California. Bruce Risher – Intelligence Coordinator, USDA Forest Service, Predictive Services in Riverside, California. Tim Chavez – Fire Behavior Analyst, CAL FIRE, Riverside Ranger Unit. John Snook – Fire Weather Meteorologist, USDA Forest Service, Predictive Services in Redding, California. Basil Newmerzhycky - Fire Weather Meteorologist, USDA Forest Service, Predictive Services in Redding, California. Marva Willey – Intelligence Coordinator, USDA Forest Service, Predictive Services in Redding, California. Vince Cohee - Coordinator, USDA Forest Service, Predictive Services in Riverside, California. Cove Inc. CA-SQF-1246 Kern County, Mountain Mesa, Lake Isabella, Kern Co. Incident transitioned from Unified Command at 0600 hrs today. Sequoia Forest will continue suppression efforts on the forest lands where needed and the state lands are in patrol status. Resources are continuing the demob process. Remaining resources continue to mop up in the riparian area. All evacuations have been lifted and Highway 178 is now open to normal traffic. Crews remained on the fire last night which did not appear to grow in size and remains at approximately 1350 acres with containment now at 40%. The main part of the fire is in the Riparian Wildlife area where heavy vegetation growth and marsh like ground cover is the predominant fuel type which is hazardous to firefighting and is being monitored carefully. Highway 178 is now fully open please drive carefully as firefighters continue to work near the roadway and large fire equipment is travelling in the area. The expected weather today will be cooler with a reduced wind speed which will help with firefighting activities. Fire crews working at the west end and central part of the fire will continue to mop up inside the fire line and around homes. “Over the winter a lot of work was done by all three Agencies to put together a Type III Incident Management Organization. This has proved very successful on our first fire of the season and will benefit the community by having the right people at the right time and will also save money by not having to bring in outside personnel in the early stages” Said David Brinsfield Fire Management Officer from the Bureau of Land Management. SOUTH LAKE –CA, Friday May 27th 2011 at approximately 12:34 the Kern County Fire Department received several calls for a grass fire north of Hwy 178 in the area of Joughin Ranch, west of Kissack Cove. The Cove fire is currently at 1352 acres and at 25% containment. Fire crews will remain on the fire overnight fighting the active fire and mopping up the inactive edge. The evacuation center previously set up at the Senior Center on Lake Isabella Blvd in Lake Isabella is now closed. For further general assistance regarding fire information please call 211. As of 8:00 P.M. tonight evacuations have been lifted and Highway 178 will be re-opened to 1 lane for the foreseeable future from Poplar at the west end to Entrada at the east end. CHP will be escorting traffic the closure is due too safety concerns with firefighters who continue to work adjacent to the roadway. Please be careful when driving through the area as there will be a lot of firefighting vehicles on the roadway. All through traffic is advised to take Sierra Highway through Kernville to Hwy 155 and back to Hwy 178 at Lake Isabella. The fire is currently being held at approximately 1356 acres and is in the Riparian Wildlife area. For further fire/evacuation center information please call 211. An evacuation center has been set up at the Senior Center on Lake Isabella Blvd in Lake Isabella. SOUTH LAKE –CA, Friday May 27th 2011 at approximately 12:34 the Kern County Fire Department received several calls for a grass fire north of Hwy 178 in the area of Joughin Ranch, west of Kissack Cove. Extreme weather behavior with high winds caused the fire to grow quickly. Approximately 200 firefighters from KCFD, USFS Sequioa and BLM arrived to fight the fire. Upon arrival fire crews were faced with a grass fire being driven by strong winds eastwards. Due to the winds no helicopters were able to drop water on the fire. Fire crews from all departments began an aggressive attack of the fire as it began to move towards homes in the immediate area. Approximately 100 structures were threatened. The Incident Commander ordered the evacuation of approximately 400 homes. Due to excessive smoke in the area and with emergency vehicles using the roadway Highway 178 is closed from Poplar at the west end and Vista Grande at the east end. Assisting Agencies include KCSO, KC Animal Control, Red Cross, Cal Trans and CHP. At 12:30 yesterday (Friday, May 27th) firefighters responded to a fire near Kissack Cove, east of the town of Lake Isabella. Upon initial attack firefighters from the US Forest Service, Bureau of Land Management and the Kern County Fire Department found the wildfire burning in grasses and being driven by extremely high winds. The winds were so extreme the two initial attack helicopters had to be grounded for safety precautions. The fire quickly grew to 200+ acres and continued in an easterly direction north of Highway 178. Firefighters worked diligently to stop the forward movement of the fire in difficult windy conditions - stop the easterly moving head and keep the fire north of highway 178. Two small fires spotted across Highway 178 to the south and were quickly extinguished by firefighters on the scene. Evacuations were put in place for residents north and south of Highway 179 from Kissack Cove to Weldon. Approximately 400 homes were threatened and 2,000 to 4,000 residents were affected by the evacuations. Heavy smoke was due to the fire burning into cottonwoods and damp ground fuels. Air tankers, engines, patrols, structure protection engines, water tenders,fire fighting handcrews, and fire overhead continue to fight this fire. Kern County Sheriff Department officers evacuated Southfork Elementary School as a precaution. The students were safely transported to Southfork Middle School a few miles away. Cal Trans and California Highway Patrol quickly set up three road blocks for firefighter and public safety. The three roadblocks were 1) Highway 178 and Poplar Street in Mt. Mesa, 2) Highway 178 and Vista Grande in Weldon and 3) Highway 178 and Entrada in Southlake. As of 2000 this evening (May 27th) California Highway Patrol will be escorting vehicles through the road blocks. The fire was last reported to be 1,356 acres. Cal-Fire arrived on scene shortly into the incident. Helicopters were grounded on initial attack due to extremely high winds. Partial damage to one structure - roof over patio was burned - house was saved. No injuries at this time. Three road closures were put into effect. 1)Highway 178 at Vista Grande in Weldon, 2) Highway 178 at Entrada in Southlake and 3) Highway 178 and Poplar Street in Mountain Mesa. At 2000 tonight (May 27th) CHP will be escorting traffic through. Remarks Southfork Elementary School was evacuated, as a precaution. The students were transported to Southfork Middle School. Update: 1220hrs 5 acres and holding. Fire is holding on the ridge for now. Still trying to make access to both flanks. .Tanker 75 released back to Ramona Tanker 70 on load and hold at Ramona. IA: AA-330 one end 2 acres in grass continue the response. Access will from the Lakeside side of the reservoir. Employee Who Shut Off Mall Sprinklers Identified - Claims Filed By Insurance Company Names Galleria Employee. KCRA 3 Sacramento has confirmed the identity of the Roseville Galleria mall employee who shut off the fire-protection sprinklers during last year's fire. ROSEVILLE, Calif. - KCRA 3 has obtained insurance claims filed against Placer County that identify the employee as a maintenance worker named John McCormick. Placer County's Risk Management Deputy CEO Maryellen Peters said the McCormick was named in the city's After Action Report released about six months ago. However, his identity was not made public. The claims state that damages to the businesses inside the Galleria were made worse by the sprinkler shut down. Peters said her department has advised the Placer County Board of Supervisors to reject all of the claims filed by insurance companies, totally about $23 million. Peters said the county is not responsible for the fire or its persistence. Multiple fires burnined in Kern County on Wednesday. At least one person was injured. All fires are under investigation by the Kern County Fire Department. We encourage anyone with any information to call 1-877-FIRE-TIP. Buttermilk Mountain area, North of Hwy 168 and Southwest of Bishop, CA Inyo Co.
Fire is in Single Command (INF) and is 100% FRA DPAUpdate: 5-26 0800 - Buttermilk Mountain area, North of Hwy 168 and Southwest of Bishop, CA Inyo Co.
Major concerns is completion of line construction mopping up hot spots prior to winds surfacing late this afternoon Current Temp 50°F Humidity: 22% Wind: Calm Gust 7 mph. Ground resources are making good progress in line construction. Location: N/W of Hwy 168 near Bishop, Inyo County. Fire is burning away from the Community of Starlight and no threat to structures. Containment: No estimated containment as yet, Firefighters are cautiously optimistic in containment some time later this evening. News and Notes: 05/221300 Trona CA- CDD-008184 Fire burned 217 acres and is 100 % contained. Location: Trona Rd, Golden Valley Wilderness San Bernardino CO. Fuels: Tall grass(2.5 feet) mixture with brush. The City of Santa Barbara announced a pending deadline for reconstructing nonconforming structures that were damaged in the Tea Fire which occurred November 13, 2008. Please be advised that the City has an ordinance that allows for the reconstruction of damaged nonconforming structures which have been damaged or partially destroyed by fire, flood, wind, earthquake or other calamity or act of God or the public enemy without a zoning modification as long as certain conditions are met. These conditions are described in Santa Barbara Municipal Code section 28.87.038.B. A building permit for the reconstruction, restoration, or rebuilding of damaged non-conforming structures must be issued within three (3) years of the occurrence of the damage or destruction: November 13, 2011. If you intend on rebuilding an existing nonconforming structure on your site, your project must have design review approval (if required) and a building permit must be submitted, approved and issued by November 13, 2011 in order to avoid the requirement for a zoning modification. The deadline only applies to the reconstruction of damaged nonconforming structures. The deadline does not apply to any proposal to reconstruct an existing conforming structure on your property, propose a new conforming structure on your property, nor does it preclude you from proposing a project that requires zoning modifications. If you have any questions about the content of this letter, please contact Renee Brooke, Zoning and Enforcement Supervisor at (805) 564-5564 for Zoning questions, Jaime Limon, Design Review Supervisor, (805) 564-5507 for Design Review questions, or Chris Hansen, Plan Check Supervisor, (805)564-5566 for Building and Safety questions. Oakland, Calif. – The California Emergency Management Agency (Cal EMA) and the Federal Emergency Management Agency (FEMA) have signed an agreement that now makes federal Public Assistance (PA) funds available to supplement recovery efforts in Del Norte and Santa Cruz counties including Yurok Tribal facilities located in Del Norte. Both counties are recovering from extensive damages from the Tsunami wave action on March11, 2011. The agreement, which is signed by FEMA's Regional Director and the Governor after every Major Disaster Declaration, outlines the Federal programs that are included in the declaration, the understandings between FEMA and the State and the commitments of the State, including the promise to follow all federal requirements. It also identifies the Governor's Authorized Representative. President Barack Obama signed a Major Disaster Declaration on April 18 that authorizes the use of FEMA's Public Assistance program to provide grant dollars to eligible state, local and tribal governments and certain private-nonprofits for repairs on a cost share basis. “The signing of the Federal-State Agreement is an important step in the recovery process," said State Coordinating Officer and Acting Cal EMA Secretary Mike Dayton. "The federal and state reimbursements now available will help eligible entities in the declared counties save millions of dollars." Under FEMA's PA program supplemental funding is made available to local, state, tribal governments and certain private nonprofit organizations to help them recover from disasters. Eligible applicants are reimbursed for extraordinary costs incurred during the response/recovery efforts and costs related to permanently restoring damaged infrastructure such as roads bridges, parks and other public facilities. “In a spirit of collaboration, FEMA will remain with our partners at Cal EMA every step of the way as these communities recover," said Federal Coordinating Officer Sandy Coachman. The fire was reported at 8:57 a.m. near Highway 243 and Pine Cove Road, according to Cal Fire. Seven engine companies responded. Updated 9:50 a.m. Firefighters were making "good progress on containment" of a residential structure fire reported at 8:57 a.m. near Highway 243 and Pine Cove Road, according to Cal Fire-Riverside County spokeswoman Jody Hagemann. "Resources will be committed approximately three hours," Hagemann said in a statement. No injuries were reported. The cause of the fire was being investigated. First posted 9:48 a.m. A three-story cabin in Pine Cove was reported on fire Monday morning and "well-involved" with power lines down in the area, a Cal Fire-Riverside County spokeswoman said. The first firefighters responding to the residential structure fire found the cabin well-involved, said Jody Hagemann of Cal Fire-Riverside County. No injuries were reported as of 9:40 a.m. and Hagemann said she was waiting for updates. Crews from Cal Fire, the Idyllwild Fire Protection District and Southern California Edison responded, Hagemann said. Comments: Update 10:45a.m. : Fire was contained at 10:21 a.m. Update 9:50 a.n. : Firefighters making good progress on containment. Resources will be committed approximately three hours. No injuries. CAL FIRE/Riverside County Firefighters are on scene of a structure fire in the Pine Cove area. The first arriving engine company reported a three-story cabin well-involved. Powerlines are down. Updates will be posted as information becomes available. Follow CALFIRERRU on "Twitter"
We’ve all seen at least one movie about flesh-eating zombies taking over (my personal favorite is Resident Evil ), but where do zombies come from and why do they love eating brains so much? The word zombie comes from Haitian and New Orleans voodoo origins. Although its meaning has changed slightly over the years, it refers to a human corpse mysteriously reanimated to serve the undead. Through ancient voodoo and folk-lore traditions, shows like the Walking Dead were born. Indio -- Cities across the Golden State are pinching pennies in an effort to balance the budget. Indio needs to cut $6 million from its budget. City Manager Dan Martinez asked each department head to propose 12% cuts to their department. Indio Police Chief Brad Ramos said he didn't want to, but would have to get rid of 6 officers.At Wednesday afternoon's budget meeting, Fire Chief Mike Marlow said he'd have to do away with the lone fire engine at the city's north fire station. Michael Cohen, a retired fire fighter and member of the City's Citizen Finance Advisory Commission responded by saying, "Optimal response time is 3-4 minutes, if they get rid of the fire truck it'll be 11-13 1/2 minutes or longer. On top of the response times, Cohen and thousands of others who live in north Indio gated and planned communities pay an extra $400 a year on top of their indio property tax. The tax is called a Mello Roos tax. "If a paramedic is needed, and the stations paramedic is gone, it will be an eleven to thirteen and a half minute response time. After 6 minutes you're brain dead," said Cohen. The mello-roos tax money is supposed to provide fire, medical and police services for new communities. Under the proposal, they'd have to keep paying the tax but wouldn't get the services. Cohen sent a strong message to the council, "If you own a home in the area, get your valuables and get out. Because it's going to burn to the ground." Council member Michael Wilson lives in north Indio and is against the cuts to police and fire. "For a big part of the north Indio community, it is an age restricted community. They look at that fire station and truck as their only life line of services. "}The budget proposals aren't final and will likely change. Other cuts will happen in Public Works, Administration, Human Services among others. The next meeting about the budget will be June 1st. City council members must pass a balanced budget by July 1. WASHINGTON - The National Transportation Safety Board (NTSB) has launched a go-team to yesterday's accident involving a Boeing 707-321B (N707AR) that experienced an engine fire during takeoff at Point Mugu Naval Air Station, Port Hueneme, CA. specially-equipped and converted civilian airplanes to serve as air refueling platforms for the military. Safety Board's four-member team. Representatives from the FAA, Boeing, Pratt and Whitney and the US Navy Air Safety Center are participating in the investigation. The three crewmembers on board the accident aircraft were not injured. Plane was carrying about 150,000 pounds of fuel. experienced an engine fire during takeoff at Point Mugu Naval Air Station, Port Hueneme, CA. Pile burning postponed, due to very damp fuels, in Foresta. Fifty piles were completed in the Foresta area Monday, May 17, 2011. 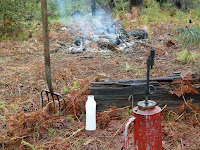 Pile burning began in the Bill’s Hill area of Wawona May 17, 2011. Firefighters were able to burn approximately 50 piles in rain, with good consumption, and little smoke impacts to the community. Burning will be conducted on permissive burn days with favorable weather to disperse and minimize smoke. Although, people with smoke sensitive respiratory conditions are advised to take precautions to minimize smoke impacts and use caution when exerting themselves in smoky areas. 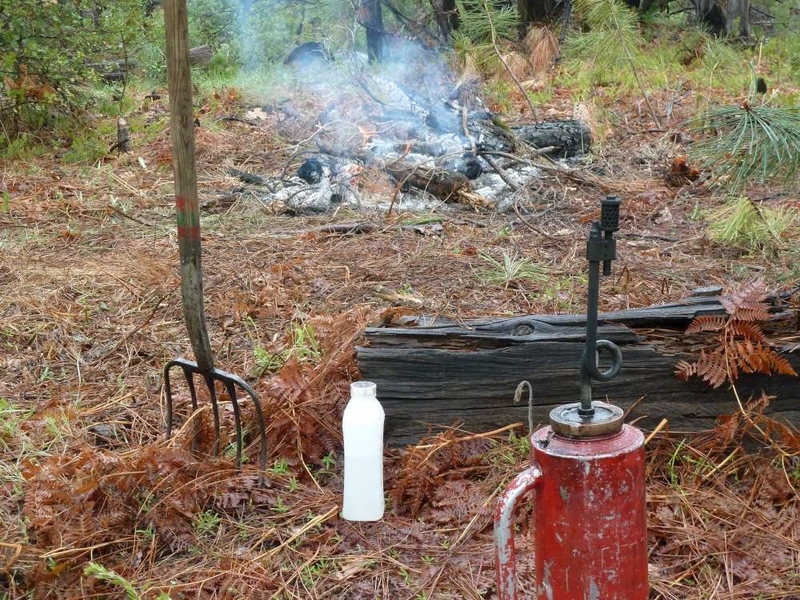 Pile burning is an effective method of removing accumulated burnable vegetation from the forest floor. When combined with other treatments, mechanical thinning or prescribed fire, piles are a relatively fast and an inexpensive method to restore fire dependent forest systems and to eliminate hazardous fuels near communities. Pile burning helps create “firebreaks” that fire managers can utilize for future prescribed fire projects or to defend against unwanted wild fire. The cool temperatures and continuing winter like conditions, predicted for this week, will make the Wawona area project easier to manage with minimal staffing and which further reduces costs. 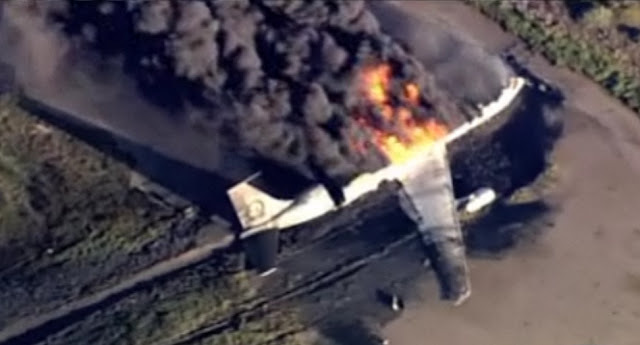 Three crew members escaped burning Boeing 707 military contract fuel-tanker that crashed about 5:30 p.m.on takeoff at Pt. Mugu Naval Air Station in Ventura County. Live television news pictures showed a large fire still burning at 6:10 p.m.
Three crew members on board were able to escape after the crash and survived. The Ventura County Fire Department has sent more than a dozen units to the scene. The cause of the crash isn't known. CALIFORNIA—Carnegie Mellon Silicon Valley in conjunction with the California Fire Chiefs Association, Communications Section and the California Emergency Management Agency will host the second annual disaster management workshop and vehicle road rally to showcase new technologies for improving mobile emergency communication May 22-23 in Mountain View, Calif. The event is co-sponsored by the NASA Ames Research Center and will be held at the NASA Ames Research Park, where CMU's Silicon Valley campus is located. “The California Emergency Management Agency (CalEMA) is excited to sponsor and support this year’s combined CMU Disaster Management Initiative Workshop and California Mobile Command Center Rally. CalEMA has always been at the forefront of disaster management and response, and our collaboration with Carnegie Mellon University truly integrates a full range of resources to serve the greater good," said CalEMA Acting Secretary Michael Dayton. Steve Jordan, CEO of the National Disaster Resiliency Center, emphasizes communications as being the most critical component in disaster response and recovery efforts. States Jordan,"The NDRC looks forward to partnering with CMU SV and the DMI in developing solutions to this important issue." More than one million people were displaced worldwide last year as a result of natural disasters and ill-equipped disaster management plans, according to recent global disaster management reports. Carnegie Mellon researchers will join a cache of firefighters, rescue workers, police, military experts and other emergency service operators to showcase and study the best practices for building resilient mobile disaster communication plans and systems. Because 85 percent of the world now communicates with cellphones or from other mobile devices and platforms, disaster managers are increasingly using social media to convey important emergency messages. An array of sophisticated self-powered satellite systems will be on display to show the importance of communication capabilities in remote areas where traditional communication infrastructure is unavailable. Specially-designed rescue and emergency vehicles also will be on display during the two-day event. Steve Ray, Distinguished Research Fellow at CMU, will be running a Plugfest designed to measure the degree of interoperability among the emergency communications vehicles and with emergency operations centers. Results of the information exchange attempts will be recorded to provide a baseline set of measurements, answering the question of "What can be done right now and where do we go next?" Jeannie Stamberger, associate director of the Disaster Management Initiative (DMI) at CMU's Silicon Valley campus, will discuss her work with various field agencies and first responders that spans several continents. From data-mining to mapping and translation, Stamberger's team met the urgent needs of the Japan earthquake and tsunamis victims earlier this year. The DMI team's work during the 9.0 Japan quake helped bridge the gap between unstructured social media and structured data. "We're also going to explore the importance of amateur radio emergency communicators during our workshop,''said Griss, who directs both CMU's CyLab Mobility Research Center and the Disaster Management Initiative to study the business, organizational and technical issues related to mobility in managing systems found in cell phones, home appliances, building infrastructures and disaster scenarios. Because handheld devices are so ubiquitous, the demand for the growth and adoption of new technologies to manage data and streamline disaster emergency communications will be an ongoing goal of this 2011 workshop and rally, according to Griss. WHAT: 2011 Golden Guardian Kickoff Press Conference with the Capitol Region American Red Cross (ARC) and launch of Ready When the Time Comescorporate readiness campaign. WHY: On Tuesday May 17th, Cal EMA Acting Secretary Mike Dayton will participate in a press conference to kickoff the three day Golden Guardian Exercise, the largest statewide disaster drill. The theme of the 2011 exercise will be catastrophic flooding in the Inland Region of California. Joining him with the overall message of disaster preparedness will be Congressman Dan Lungren and ARC Capital Region CEO Dawn Lindblom, who will be launching the corporate readiness campaign, Ready When the Time Comes. On Wednesday, May 18th, Cal EMA Acting Secretary will participate in an executive/media briefing with Department of Water Resources staff. Flood fighting resources and activities will be discussed. In addition, media will be able to observe DWR Incident Command teams as they simulate flood activity and response at Twitchell Island. PITTSBURGH—Carnegie Mellon University's Silicon Valley campus, in conjunction with the California Fire Chiefs Association and the California Emergency Management Association, will host the second annual Disaster Management Initiative Workshop and Mobile Command Center Rally to showcase new technologies for improving mobile emergency communications May 22-23 in Mountain View, Calif. The event is co-sponsored by the NASA Ames Research Center and will be held at the NASA Research Park, the site of CMU's Silicon Valley campus. "The workshop is designed to explore and unveil new technologies and processes for improving disaster communication worldwide," said Martin Griss, director of Carnegie Mellon Silicon Valley. "Recent events, such as earthquakes, terrorist attacks, hurricanes and power outages have shown us that abrupt interruptions to our businesses and daily lives are not far away." Carnegie Mellon researchers will join a cadre of firefighters, rescue workers, police, military experts and other emergency service operators to showcase and study the best practices for building resilient mobile disaster communications plans and systems. Because 85 percent of the world now communicates with cellphones or from other mobile devices and platforms, disaster managers are increasingly using social media to convey important emergency messages. An array of sophisticated self-powered satellite systems will be on display to show the importance of communications capabilities in remote areas where traditional communications infrastructure is unavailable. Specially designed rescue and emergency vehicles also will be on display during the two-day event. Steve Ray, a distinguished fellow at CMU, will be running a "Plugfest" designed to measure the degree of interoperability among the emergency communications vehicles and with emergency operation centers. Results of the information exchange work will be recorded to provide a baseline set of measurements, answering the question: "What can be done right now, and where do we go next?" Jeannie Stamberger, associate director of the DMI at CMU's Silicon Valley campus, will discuss her work with various field agencies and first responders that spans several continents. From data mining to mapping and translation, Stamberger's team met the urgent needs of the Japan earthquake and tsunami victims earlier this year. The DMI team's work during the 9.0 Japan quake helped bridge the gap between unstructured social media and structured data. "We're also going to explore the importance of amateur radio emergency communicators during our workshop to study the business, organizational and technical issues related to mobility in managing systems found in cellphones, home appliances, building infrastructures and disaster scenarios," said Griss, co-director of CMU's CyLab Mobility Research Center and the DMI. Griss said because handheld devices are so ubiquitous, the demand for the growth and adoption of new technologies to manage data and streamline disaster emergency communications will be an ongoing goal of the 2011 workshop and rally. "The California Emergency Management Agency (CalEMA) is excited to sponsor and support this year's combined CMU Disaster Management Initiative Workshop and California Mobile Command Center Rally. CalEMA has always been at the forefront of disaster management and response, and our collaboration with Carnegie Mellon truly integrates a full range of resources to serve the greater good," said CalEMA Acting Secretary Michael Dayton. "Following on last year's very successful first disaster management workshop, I am very pleased to see the expansion of the number of emergency service organizations participating this year," said Robert Dolci, chief of the Protective Services Office at Ames. "Collaborative participation is the key to enhancing emergency management and disaster preparedness." Steve Jordan, CEO of the National Disaster Resiliency Center (NDRC), says communications is the most critical component in disaster response and recovery efforts. "The NDRC looks forward to partnering with Carnegie Mellon Silicon Valley and the Disaster Management Initiative (DMI) in developing solutions to this important issue," Jordan said. Yosemite National Park will start debris pile burning Monday, May 16, 2011. Camp Wawona, and the South Entrance. utilized during future prescribed fires in the area. smoke due to the pile burning in the Yosemite area. piles, even with direct sun exposure, needed an extended drying period. Why we do not chip and haul or leave in place?.